Our Prime Minister was Home Secretary and in charge of MI5 when they were tipped off about Abedi – do the victims’ families have a right to an explanation of why the warnings were not heard? Ramadan Abedi, a former Libyan intelligence official, had been sent back to Libya by the MI6 to participate in the operation on the side of Al-Qaeda. His son, Salman, then aged 16, fought on Libya’s side. Salman Abedi is reported to have also had contact with jailed IS recruiter Abdalraouf Abdallah, another British-Libyan from Manchester who suffered paralysing injuries while fighting with the 17 February Martyrs Brigade in Libya. David Shaylor alleges that Ramdan Abedi was "Tunworth" According to former MI5 officer and whistleblower David Shayler, the episode began when a Libyan military intelligence officer approached MI6 with a plan to overthrow Qadafi. The Libyan, codenamed 'Tunworth', proposed establishing links with the LIFG. Shayler asserts that he was told by an MI6 officer, David Watson, that in Christmas 1995 he, Watson, had supplied Tunworth with $40,000 to buy weapons to carry out the assassination plot and that similar sums were handed over at two further meetings. A secret MI6 cable dated December 1995 — leaked in 2000 and published on the internet — revealed MI6's knowledge of an attempt to overthrow Qadafi in a coup led by five Libyan colonels scheduled for February 1996. There are thousands of Libyans in Manchester who hate the Gaddafi regime. The city is home to Britain’s largest Libyan community. Almost every elder you meet fled Libya in the last 20 years, warned that they would be arrested or killed if they stayed, simply for calling for change. Those who travelled to Libya to fight alongside Islamic rebel groups have described how, even though they were subject to counter-terror orders banning them from leaving their homes because they posed a security threat, they were allowed to travel to the hostile warzone. 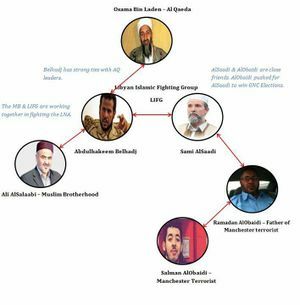 When they returned to the UK, having spent months alongside groups thought by British intelligence to have links with Al-Qaeda, rebels were said to have been allowed back into the country without hesitation. Libyan officials have backed up the claims, saying the British government were 'fully aware' of young men being sent to fight, turning the North African country into an 'exporter of terror'. There is no greater structural threat to a secular Muslim-majority country than Salafists, which is why the West welcomed those “fleeing” from the “political and religious repression” in their homelands in order to weaponize them for future Hybrid War use. This page was last edited on 24 November 2018, at 21:13.